With a provincial election looming, the opposition Progressive Conservatives are riding high. If polls are to believed the PCs are the clear frontrunners to form government after April 19. Meanwhile, the governing NDP has been trying to keep their heads above water. While recent polls have shown early signs of a moderate bounce back in Winnipeg, the party has been struggling to convince voters to grant them a fifth mandate. The media has repeatedly pointed to the one per cent PST hike implemented under the NDP in 2013 as the reason for the party’s poor polling numbers. We’ve heard from commentators, political operatives, and some of the most clamorous indigniphiles on social media that the one per cent increase was unjust – the last straw from a stale incumbent government. News anchors and journalists have generally avoided saying it directly, but have questioned it and validated those who do ad nauseam, keeping it at the forefront of the public’s consciousness. In response, the PCs – who’ve largely led the charge on the PST complaints – have said that if they form government they’ll reduce the PST back to seven per cent in their first term and mandate that any proposed increase to the PST or other major income or retail taxes will go through a referendum. 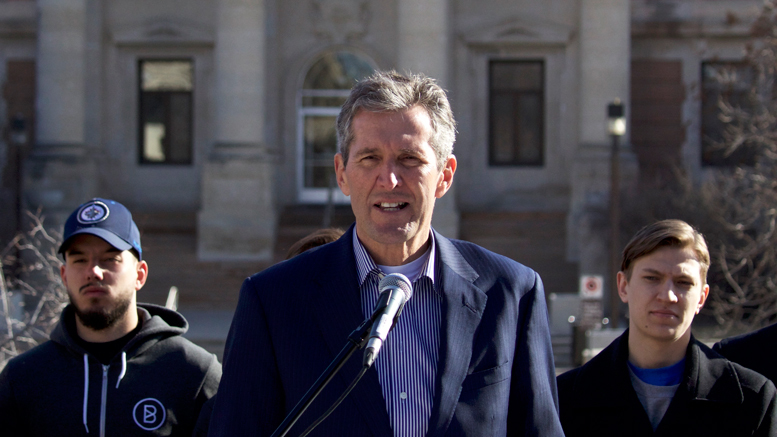 The problems with the PCs’ populist proposal come on two fronts: the practical realities of the Manitoba government’s current situation and the more abstract problems tied to this approach to taxation. The PCs are promising to reduce the PST to seven per cent and reduce taxes, while also vowing to “protect front line services.” All the while ending – one would assume based on their criticisms of the NDP deficits and their own support of balanced budget legislation – the string of deficits the province has faced since 2009-10. Think about that for a moment. After forming government, the party wants to reduce revenues, avoid cuts, and end up with more money than the previous government has in any of the last seven years. The PCs haven’t explained how this would be at all feasible, other than to say they’d go after inefficiencies that exist as a result of the NDP’s careless approach to governance. And with that they’ve managed to moralize their way around a simple question of math. Every so often in a democracy, people get suckered in by the argument that the government of the day is spending wastefully and that a change in government would allow a new group to trim out the fat, allowing for a reduced tax burden with no loss to services. While there are always legitimate disputes over spending priorities and governments should be held accountable for misspending when it happens, the argument over “efficiencies” is a con. No government goes in and finds a deficit’s worth of “efficiencies” in government spending. If you’re not willing to pay for it, it’ll always be services that get cut. The PCs know this. And they also know, after four consecutive election-day hammerings, that the public doesn’t want what they’re actually offering: cuts. The hints are there, behind coded language about “having conversations,” “value-for-money reviews,” and “eliminating waste” – it’s the kind of tactic used to reassure one’s base while allowing for plausible deniability before election day. But dropping the PST back to seven per cent when we’re already running deficits means some services the government provides for citizens are going to suffer. We just haven’t been told what they’ll be yet. A system in which the government can decrease taxes and change spending as needed but requires a referendum to increase taxes – however small the increase may be – will inevitably lead to a very unbalanced balance sheet, and then cuts to services. This sort of system would provide a disjointed view where taxes are disconnected from government spending and thus outcomes. If a tax increase isn’t directly connected to an increase in spending, then why would anyone ever support one? Whether it’s elected officials representing constituents or the broader community through consultations, a functional system requires that whoever’s driving has two hands on the wheel. The federal Conservative party didn’t require a referendum to drop the GST from seven per cent to six per cent in 2006. And they didn’t require a referendum when they bumped it further down to five per cent in 2008, even though both changes inevitably meant a reduction in the amount and quality of services the government could provide. It’s worth remembering that with the one per cent increase in PST, Manitobans were still paying a lower rate of sales tax than before 2006. The complete lack of vision from critics, fueled by a complete lack of context from media, has kept the NDP on the defensive on this issue, even now, three years later. Maybe it’s time to put things in perspective.